Paragon Energy studies the half hour data as shown in this Graph to advise our customers which is the best structure (tariff) for the electricity contract. The graph below is taken from a Paragon Energy customer. The graph shows the half hour data of one of their medium sized offices on a typical day in September. Paragon Energy can also provide our customers with the half hourly data on request. 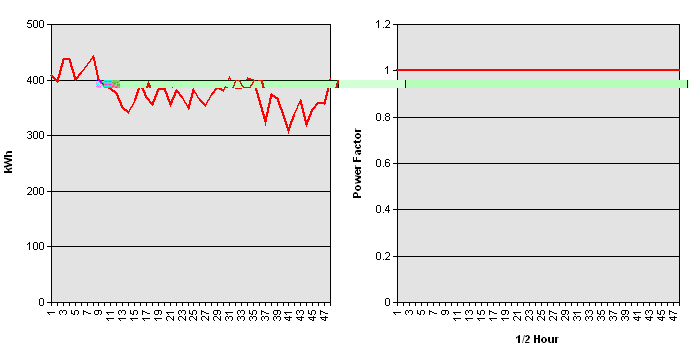 The half hour data below shows the Electricity used by an industrial customer. Paragon Energy used the data to see when the industrial site was using its maximum level of electricity so we could advise what structure (tariff) and which supplier could offer the greatest saving when the Electricity contract went out to tender.